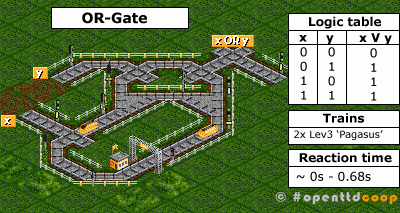 First of all, we’ll have a look at the requirements to understand logic gates, as I create them, in OpenTTD. A default signal can be either red or green. These two states can be defined as true and false or as 1 and 0 or zero and non-zero or easily as yes and no. In fact, it is a system with only two states. A Maybe doesn’t exist. As you can see it, doesn’t matter which state has which name, but it is important for the definition and further constructions. That’s just a matter of the question you ask yourself. My question is: Is a train in the signal block?. The complete logic turns around if you ask yourself: Is the track free?. Please keep in mind that my definition is _NOT_ equivalent to the definition of ‘red’ and ‘green’ used in electronics. I still decided to do it this way, because the AND-gate is easier to build in this case and I somehow think it is used more often in complicated constructions like the XOR-gate. You also should know, e.g. 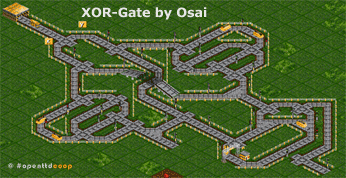 when you build your own logic gate construction, that I always used two trains to create it. One train and a signal block with more than one exit signal (-< =) is always vulnerable for a signal-lock-situation. In this case the train enters the block and while choosing a track, the chosen track and its signal turn red. The train is locked and it takes several seconds to return and choose the correct exit. 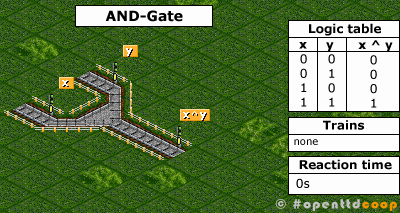 I really like Marks Idea for a NOT Gate, but it might cause unintended problems. Using two trains avoids this problem because the first train stops and the train behind must always choose the other option which changes the state of the logic construction. I optimized all construction for two Lev3 ‘Pegasus’ (Maglev) and added sometimes a wagon to make the train a half-tile longer. Lev3 is better than Lev4, because Lev4 for is accelerating too fast and both trains slow each other down all the time having a lower average speed than Lev3. All slower trains (482km/h for Lev3) work too, but the reaction time is slower. I told you a lot about the requirements now and unluckily the first logic gate is very simple. 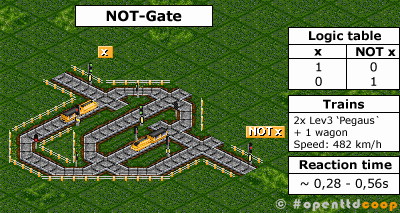 The feature of AND logic is hardcoded in OpenTTD (all entrance-exit-blocks work that way) and we don’t have to add further additions to this signal block. What happens here is easy, as the logic table shows you only if both signals (x, y) have the same (1) state the output (x^y) is (1). In other (easier) words x and y have to be red to turn x^y red as well. The NOT gate returns always the opposite of the input. Two trains, the loop and a prio-line were needed to create this construction. It looks a bit like a maze, because I shrank the size as much as possible. 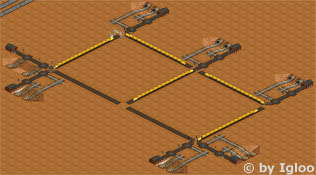 For this construction you need two Lev3 with one wagon or two double Lev3 to work properly. If you don’t the output might turn 0 for a millisecond. The OR-Gate was the trickiest to construct. I had many problems with incorrect output in the beginning, but I found a clever solution. Again you need a loop and a one-tile prio for the input x. If input x turns red, the first train will stop at the entry-signal of the inner loop right in front of input x. The second train will avoid the inner loop and use the outer loop. If the train is there, the output turns red regardless of the input y. The thing I am really proud of is, if input y turns red, the loop is ignored and the output turns red immediately. With these three logic gates you can create many other logic gates or logical constructions such as XOR, half adders, full adders or even flipflops. Though I doubt it is possible to create a complete ALU (e.g. the slow reaction time), but constructions helping us to regulate the traffic and the movement of our trains in complex openttdcoop network should be possible. I hope you gain something from my little article about logic gates and enjoyed reading. Now head on, build your own logic gates or implement them in any other weird network construction. Please post your results as comments, at our wiki or send an email to info [at] openttdcoop [dot] org. The build I used + a updated savegame. 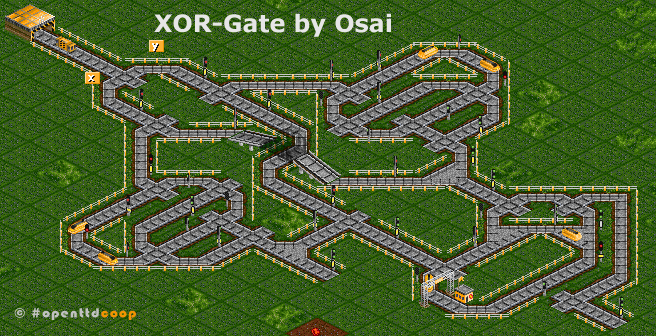 I’ve created a not gate where the train loops instead of stops. I believe it to be faster then previous versions but I haven’t done any advanced benchmarking on it. It’s based on the not gate Igloo posted in the original thread. I’ve come up with another interesting method for storing data. Taking away the WRITE and READ inputs and then toggling RESET just before setting DATA could make this into some very fast memory indeed, if that’s what the job requires. With the WRITE and READ inputs (which write-protect and prevent reading from the memory, respectively), this can be quite a permanent storage solution, so long as it has a reliably red RESET input. WOW SERIOUSLY guys, i taught i was really crazy wanting to make a calculator in minecraft. But this, isn’t it a bit of a problem that the trains walks away the whole time you need it? I mean just think about it. In minecraft you have the difference of button and switch. Switch stays powered but button is just temporary. I tried to make one using just buttons. And i just ended up screaming at the computer! 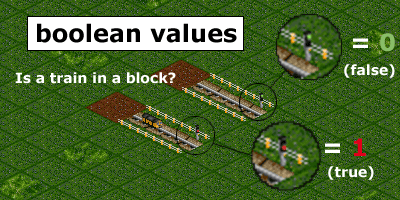 I believe you can make anything here, but in openTTD you will need to make your own little components which together give something – be it a buttong, switch, or whatever else, while minecraft already has some of those parts complete.